I have used ferrite material to successfully attenuate common mode signals for years . Common mode currents are those currents that flow in the same direction on a wire bundle, as opposed to the currents that flow in opposite directions on wire pairs to form a complete circuit. The differential currents cause a net flux of zero in the core and consequently are not affected by the core. However, the other day I discovered that I had misunderstood what was really happening. I knew that if you wound a cable on a toroid made of ferrite material that you could get an attenuation of the common mode signals on that cable, but I always thought it was due to just the impedance from the increased inductance that the ferrite provided. Yes, I had read the specification sheet and noted that the cores provided loss, but it never clicked...inductance does not provide loss; resistance does...duh. Well, I recently acquired a nice little piece of test equipment, the AIM 4170 impedance measuring device developed by Bob Clunn, W5BIG, and sold at Array Solutions. Without Bob's nice design, none of these measurements would have been possible on my budget. The impedance of a wire passing through or wound around a ferrite core can be inductive which is associated with permeability, resistive, and even capacitive which is associated with self resonance. All three of these parameters are frequency dependent in a ferrite. The maximum attenuation of a ferrite core is not where the inductance is maximum, but instead is where the magnitude of the impedance is maximum. This impedance peak may even be where the impedance has no inductive component nor capacitive component i.e. at resonance. The frequencies that you are trying to attenuate determine the core that you should use. Let me explain the basics of complex impedance a little so the following graphs will make sense to those of you who might be new to the field. Impedance is generally made up of two components, resistance and reactance. These two components are vector components i.e. they have a magnitude and a direction. We will define these vectors on an X-Y grid. Resistance will be a line going from zero to some value on the X-axis. The direction of resistance is always from zero to the right and the length of the line represents the value of the resistance. Reactance will be a line that is perpendicular to the resistance line i.e. it is a line that either goes from zero up if it is an inductive reactance or zero down if it is a capacitive reactance. Again the length of the line indicates the magnitude of the inductance. These lines fit our definition of a vector in that they have both magnitude and a direction. We will define the resistance as R and the reactance as X. Since the reactance is in a different direction from the resistance, we will place a J in front of the X to indicate this. Now we have an expression R+JX if there is a resistance in series with an inductive reactance or R-JX if the resistance is in series with a capacitive reactance. XC is used to designate a capacitive reactance and it is related to the value of the capacitor by XC=1/(2*PI*f*C) where PI = 3.14159... , f is the frequency in Hz, and C is the capacitance in Farads. XL is used to designate an inductive reactance and is related to the value of the inductor by XL=2*PI*f*L where PI=3.14159..., f is the frequency in Hz, and L is the inductance in Henries. 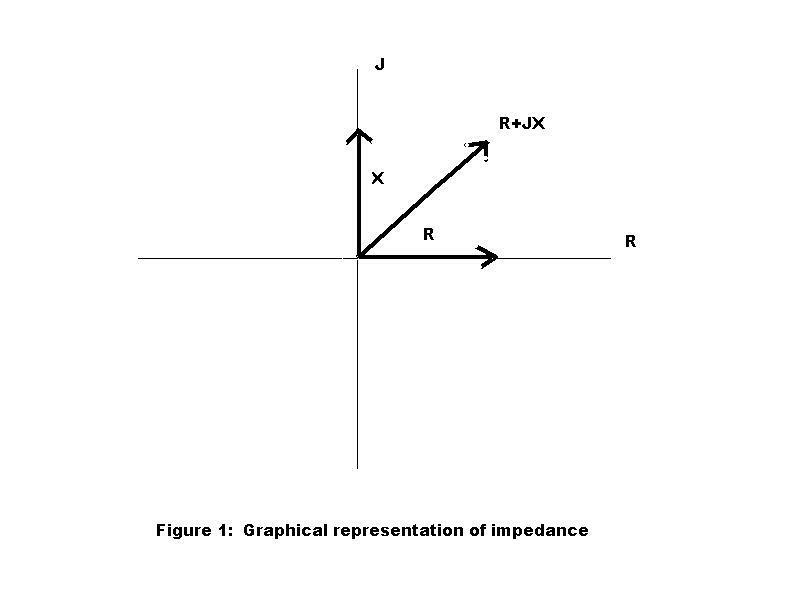 This representation of impedance is shown graphically in Figure 1. Since the resistance and reactance vectors form a 90 degree right angle, the magnitude of the sum of the two, R+JX which we will call Zmag , can be found by taking the square root of the sum of the squares i.e. Zmag = SQRT(R^2 + X^2). Since Z is a vector and Zmag is its magnitude, we need some way to specify which way it is pointing. The convention for this is to measure the angle from the X-axis or in this case the R-axis. If you remember any trigonometry at all, recall that the angle that the vector R+JX makes with the horizontal axis is given by the inverse tangent of X/R. Let us assume that R = 3 ohms and XL= 4 ohms. Then Zmag = SQRT( 9+16) which is 5. The angle, or phase angle theta, as it is typically called, is the inverse tangent of 4/3=1.333 which is 53.13 degrees. We can now say that the impedance is 5 at an angle of 53 degrees. Since theta is positive, we know the reactive part of the impedance is inductive. If X had been negative the magnitude would have remained the same, but theta would have been the inverse tangent of -4/3=-1.333 which is -53.13 degrees. We would now say that the impedance is 5 at an angle of -53 degrees and we would immediately know that the reactive part of the impedance is capacitive because of the negative phase angle. If the impedance is purely reactive i.e. the resistive part of the impedance is zero or very, very small, then the R vector will be zero or very, very short. This results in a phase angle of 90 degrees if the reactance is inductive or a phase angle of -90 degrees if the reactance is capacitive. The horizontal axis is frequency and it runs from 0.1 MHz to about 30 MHz. Figure 2 is the plot from the 12 inch wire in the fixture. Observe from the curves and the listings on the right of Figure 2 that theta is 90 degrees and R=0 which indicates a pure inductance or R+JX is equal to J60.44 ohms at 29.736 MHz and the inductance is 0.324 uH. Since there is no resistive component, Zmag = 60.44 ohms which is due entirely to the inductance. The curves behave exactly like you would expect. The inductive reactance is increasing linearly with frequency, there is no resistance, and theta stays at 90 degrees. Zmag, which is in green, actually is the same as the black curve which is the inductive reactance. Figure 3 is the same 12 inch wire with a snap on ferrite over the wire which would be considered one turn. Now you can see that there is a resistive and an inductive reactance component to the impedance. If you look at the values on the right for a frequency of 29.736 MHz, you will see that the resistance, Rs (the s stands for series resistance), equals 147 ohms and the reactance, Xs (the s stands for series reactance), equals 162 ohms. Solving for Zmag which is equal to the square root of the sum of the squares of the resistance and reactance, we get the value 218. Since the reactance is just slightly larger than the resistance, we would expect theta to be slightly larger than 45 degrees. And indeed it is, Theta = 48 degrees. Now what does all this mean? Well, first of all, the impedance now has a resistive component, which must come from the core since there was no resistive component in Figure 2. Also, The reactance has increased from 60.44 ohms to 161.575 ohms and Zmag has gone from 60.444 to 218.368, a factor of more than 3.6. You can see from this plot that we have a complex relationship here. The inductive reactance is no longer linear as it flattens out as frequency increases. There is a resistive component and theta is no longer 90 degrees. The next plot, Figure 4, shows the same parameters with the turns doubled from one to two. One would expect the inductance and hence the inductive reactance to increase by a factor of four since the turns were doubled and the increase is a function of turns increase squared. That is not what happened. The inductive reactance is starting to fold over as can be seen by the black curve. However, the resistance increase was close to a factor of four. The important thing is that Zmag, which is responsible for the attenuation, is increasing. If you ever wondered why some of these baluns that are wound on ferrite were destroyed by heat, here is your answer. Remember any RF current, at the specified frequency, through the wire would produce a power equal to the resistance times the current squared. That power will generate heat in the core. 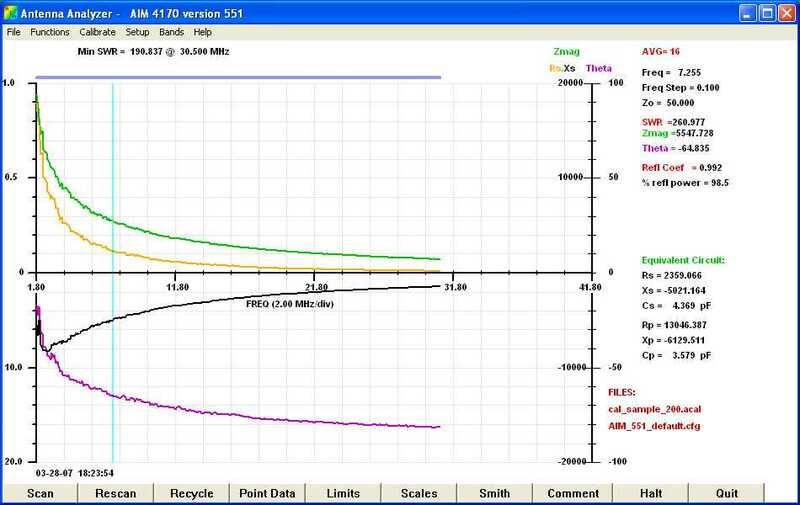 Let us say that we had an rms current at 30 MHz of 250 ma through our single wire (Fig 3). When we clamp the snap-on core onto the wire, the resistance is about 147 ohms which means that about about 9 watts will be dissipated in the core. This core is 0.75 x 0.75 x 1.25 inches long. I would say it would not be long for this world. That is why these ferrite snap-ons are good for common mode currents which are generally small but should not be used for a differential current like a decoupling choke where the RF current could be large unless the resistive part is small enough not to cause a power heating problem. One interesting feature in Figure 4 is the inductive reactance starting to turn over. Out of curiosity, I extended the sweep range to 170 MHz to see where that was going. Figure 5 shows the results of that frequency sweep extension. As one can see from Figure 5, theta goes through zero and becomes negative at 53.506 MHz. The reactance part of the impedance becomes capacitive at this point and Zmag turns over and starts becoming less. The resistance component is decreasing, and the capacitive reactance is increasing. However, the resistance continues to decrease after the capacitive reactance levels off. Since Zmag is a function of both these quantities, it decreases. Now, one might speculate that the capacitance between those two turns of wire is what caused this resonance condition. The maximum reactance over the whole frequency range occurs at 20 MHz and is about 400 ohms, which translates to an inductance of about 3.2 uH. The capacitance needed to resonate that inductance at 53 MHz, is about 2.8 pF. If I place two wires adjacent to each other as they might be placed as they pass through the snap-on core, the capacitance between the two wires is about 2.5 pF. So, I have concluded that it is the inter-winding capacitance of the two wires that cause the inductance to turn over, decrease, and finally become zero at the resonant point. So what does all this mean. Traditionally one thinks of a core material as a concentrator of magnetic field lines. In other words, the core brings the field lines closer together which raises the inductance. The amount that this is done is reflected in the permeability of the core. Air has a permeability of one. A type 43 material ferrite has an initial permeability of 850. The interesting thing about ferrite permeability is that it is not a constant, but instead a complex quantity consisting of resistance and reactance. I am certainly no expert on magnetics, so for a good discussion on this subject, click HERE. In contrast, to the ferrite core plots above, I scanned a T-80-2, powdered iron core, with 19 turns. That scan is shown below in Figure 6. As you can see from Figure 6, the resistance remains zero and the self-resonace is very sharp. Theta switches from +90 degrees on the low frequency side of resonance to -90 degrees on the high frequency side of resonance just as you would expect for an air inductor. This behavior for the powdered iron core is very different from the ferrite cores shown above. Figure 7 below shows the jig I used to actually determine the attenuation one might expect from a given ferrite inductor. Attenuation = 20* Log((Zmag + 50)/50). This will yield a result within a few db of the measured values. 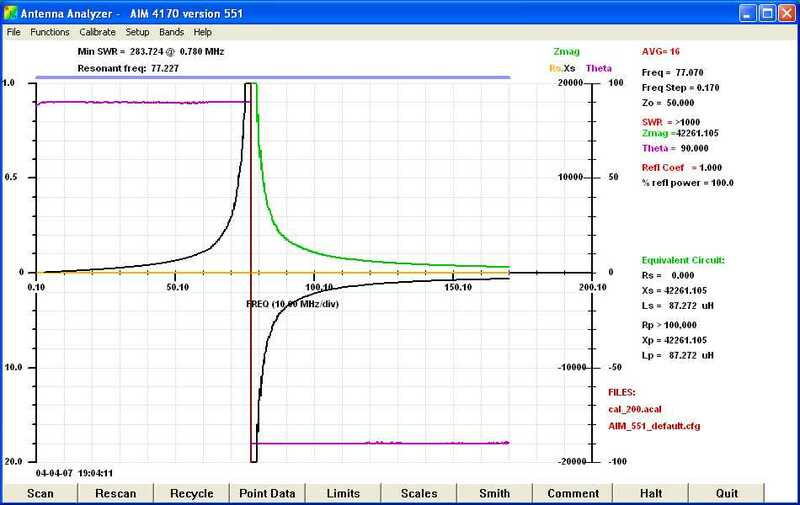 Figure 8 shows an impedance plot for a 1 mH choke consisting of 30 turns on an FT-114-77 core. Figure 9 is an expanded view showing the parameters over the 40 meter band. When you first look at Figure 8, it looks terrible. But let's take a closer look. First of all, the reactive part of the impedance is capacitive from the start, but the capacitance is small so the reactance is still pretty large for the 40 meter band where I am using this core. Also, the resistance appears in series with this reactance. 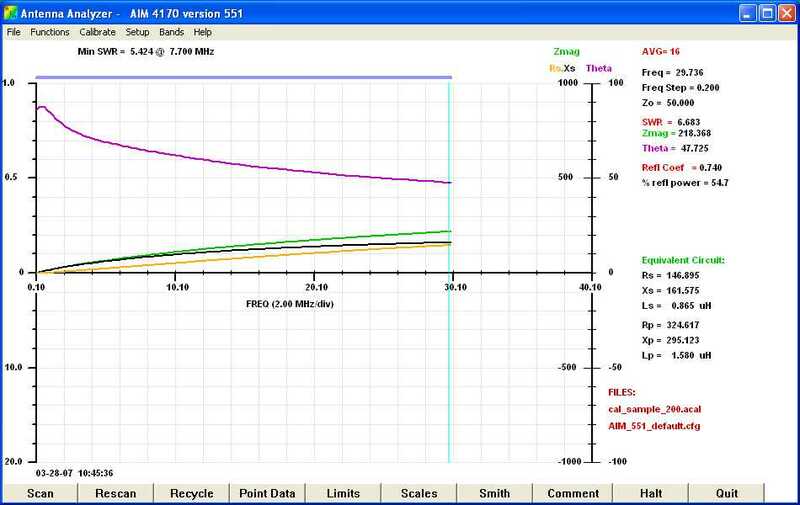 In fact, Figure 9 shows that the impedance is almost flat over the 40 meter band with a Zmag = 5570 ohms at 7220 kHz. 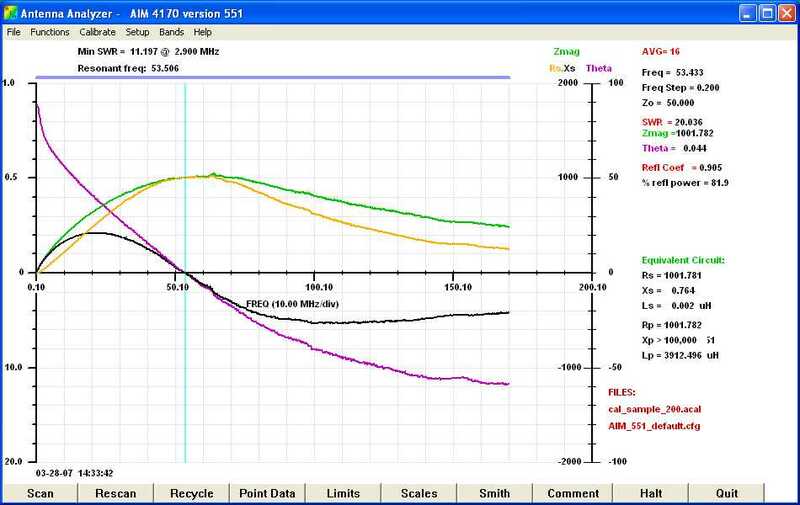 The attenuation in our jig shown in Figure 7 should be 20*Log((5570+50)/50) = 41 db. When I placed it in the jig, I measured 43 db. I would have done a similar plot for an FT-114-43 core, but the only one I had on hand is in a halogen light in a neighboring building. Nevertheless, the plot would have been similar with a little more attenuation at the higher frequencies. The curves shown in Figure 10 are the results of attenuation measurements of both FT-114-43 and FT-114-77 cores on all the HF ham bands. As you can see from Figure 10, more turns do not always mean more attenuation as seen in the blue and tan curves. The literature has always recommended a type 77 material ferrite for the lower HF bands and a type 43 ferrite for the upper HF bands, and the red and black curves confirm that. And, not surprisingly, a 43 core in series with a 77 core yields good attenuation across the whole HF band as seen by the green curve. Figure 10 gives a quantitative result for what we have known qualitatively for years. One of the most common uses of ferrites in the ham community consists of a series of ferrite beads slipped over the coaxial feed line of an antenna in the form of a choke balun. These ferrite beads attenuate the RF current that may be flowing on the outside of the coax due to an unbalanced feed line feeding a balanced antenna or radiation of the antenna onto the feed line. Figure 11 shows a plot of a piece of wire with seven SB-1020-43 beads slipped over it. These beads are made from type 43 material and will slip over RG-8 type coax. As you can see from the plot in Figure 11, the attenuation on 160 meters is mainly due to the inductive reactance part of the impedance, whereas the attenuation at 10 meters is mainly due to the resistive part of the impedance. 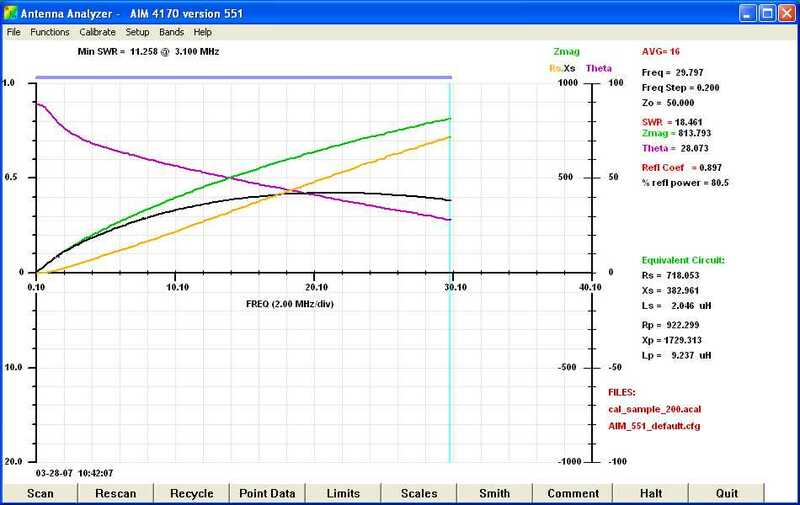 If we assume the minimum impedance is 4 X 50 = 200 ohms, seven beads is just adequate for the 160 meter band. 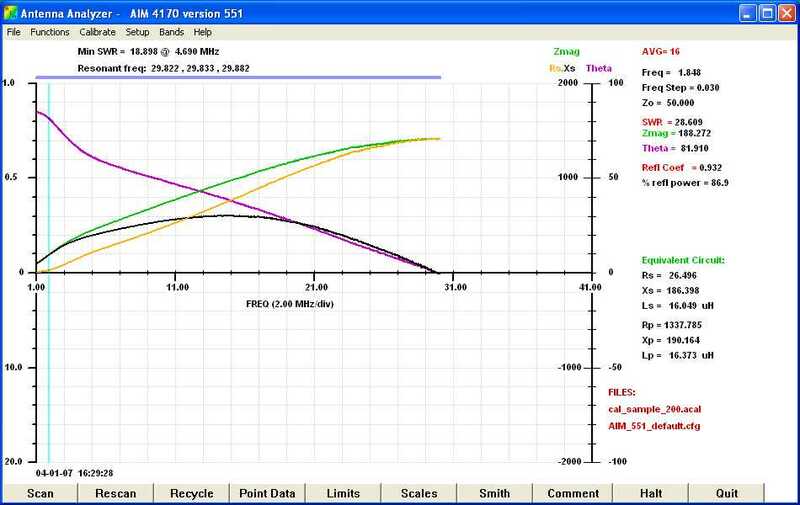 From our experience from previous measurements, if we slipped a few more beads on the coax, we would see that the reactive part of the impedance would be capacitive at the 10 meters frequency, but Zmag would still be large and give plenty of attenuation. I hope that this analysis has been interesting and has explained some of the strange results you may have gotten when using ferrites in the past. Ferrites are wonderful materials that I feel we as hams will be using more and more. With antennas being forced down lower, the chances of interference to less and less robust consumer electronics are increasing. 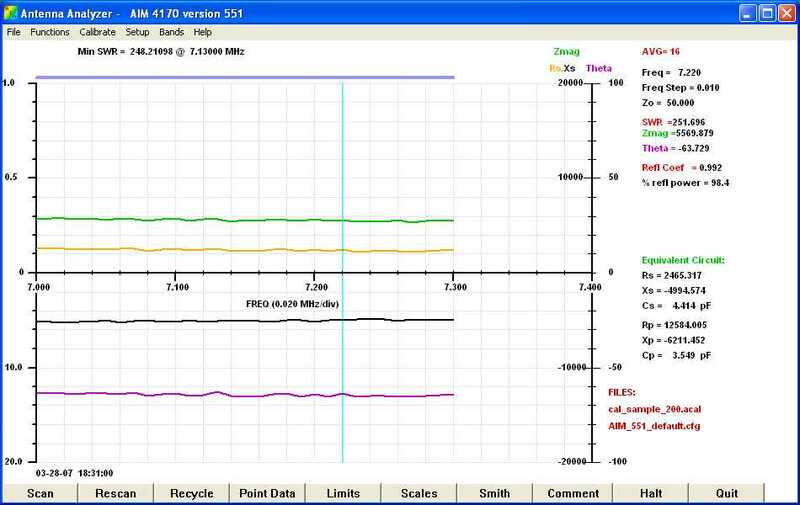 A common mode choke using either ferrite snap-ons or ferrite cores can eliminate a lot of this interference. Also, many new lighting plans include halogen lights with switching power supplies that generate interference at high frequencies. Common mode chokes may be useful in these situations, also. Many consumer devices such as plasma TVs will radiate into our HF bands. Common mode chokes on leads emanating from these devices may very well cure the problem. I learned from these measurements that the ferrite material itself can be responsible for an inductor having a high resistive component . The permeability of the material , which is a function of frequency, account for the interesting behavior the inductance over the frequency range. Also, there is resistive component that varies with frequency. The maximum attenuation of a wire passing through or wound on a ferrite core does not necessarily occur at the frequency where the inductive reactance is maximum, but instead where the magnitude of the impedance is maximum. Useful attenuation may even occur at a frequency that is higher than the self resonant frequency where the reactance is capacitive. 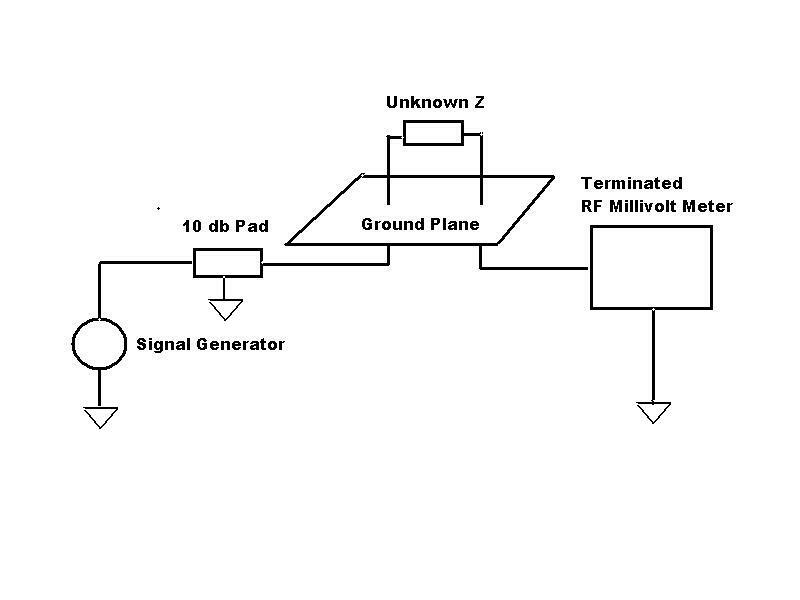 The type of material one uses for a common mode choke whether it be 33, 43, 61, or 77 material is a function of the band of frequencies that need to be attenuated. A core material should be chosen such that the frequencies to be attenuated are near the frequency where theta crosses zero. However, good attenuation may be had at frequencies removed from this resonant point because of the low Q of the coil. One must consider resistivity and permeability when slipping ferrite beads over a conductor to gain some common mode attenuation, because the attenuation and loss is effected by all of these parameters. Also, a good understanding of the loss factor of a ferrite might save you from a very hot core. Remember that there is big difference between a ferrite core and a powdered iron core. A coil wound on a powdered iron core behaves much like an air core as long as the core does not saturate, but a coil on a ferrite core may be very lossy. Also, since permeability is temperature dependent a ferrite core should not be used in a resonant circuit. If nothing else this strange phenomenon of a coil of wire looking resistive and even capacitive has been interesting to me. I hope you have found it interesting, too!